Buy Classic Volks – found this one Rabbit diesel being offered for sale in Craigslist looking for $1650 located in Hudson Valley. As shown here is first generation Rabbit known as MK1 fairly cool 4-door plus a rear door body designed as small family car then known as the best and most fuel-efficient cars on its era. Not perfect, the interior was good but the frame has a lot of rust, body expert needed to fix it. This entry was posted in 1984, Closed, Rabbit, USA, Volkswagen and tagged Volkswagen Rabbit Diesel on March 12, 2017 by buyclass. Buy Classic Volks – a nice classic Volkswagen Rabbit Diesel for Sale in California, on good condition. 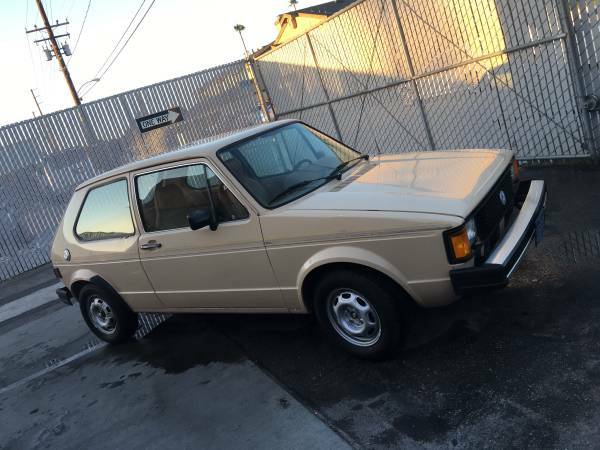 it’s a 1981 model powered by a 1.6 liter Diesel 4 speed manual trans runs and drives great no issues, come nice with new paint very clean Inside and out complete with a original radio, fairly cool 5-door hatchback it has been driven about 192000 miles. This entry was posted in 1981, Closed, Rabbit, USA, Volkswagen and tagged Volkswagen Rabbit Diesel on October 17, 2016 by buyclass.